Around one in three people in the western world will develop cancer at some stage in life and complementary therapies are increasingly being used alongside orthodox treatments as part of the 'integrative' approach to cancer care. 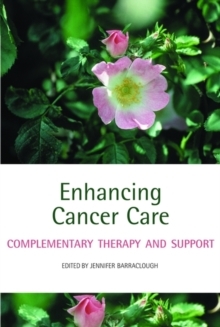 Enhancing Cancer Care is a practical, evidence-based guide to complementary cancer therapies, also described as natural or holistic therapies. More and more patients are turning to these therapies as there is now considerableevidence that they can help with symptom-control and quality-of-life, and that some may also extend survival. Complementary therapies can also provide the patient with a greater sense of control regarding the management of their illness. From the editor of Integrated Cancer Care, this new title provides detailedcommentary on a broad range of complementary therapies and features practical advice on how to implement therapies to enhance current practice. The first part of the book deals with the general principles behind complementary therapies and the factors driving their growing popularity, the challenges of evaluating their benefits and unwanted effects, and experience of using them in oncology units, hospices, the private sector and primary care. The second part includes chapters on specific interventions, including complementary therapies such as acupuncture and aromatherapy massage; lifestyle modifications through diet and exercise;creative therapies using art and music; and psychological and spiritual support for individuals and groups. These chapters provide descriptions of the therapies, a summary of the evidence for their benefits in cancer care, and illustrative case histories. The emphasis throughout this book is on enhancing practice; that is, using the therapies alongside conventional medicine, rather than as alternatives to it.